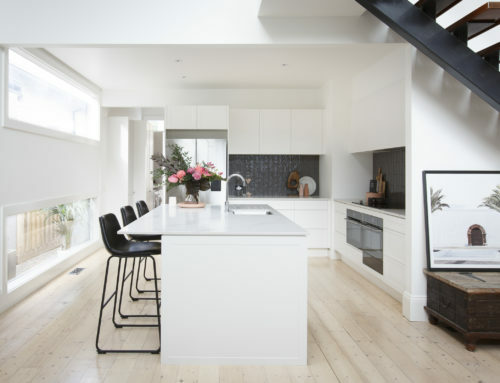 The modern laundry is a room re-imagined. 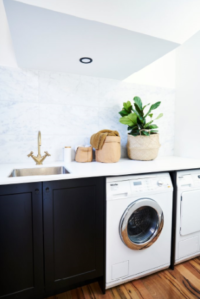 No longer an overlooked nook or sorry-looking space void of style, it’s often now designed to be a place that’s pleasurable to work in –and it’s actually more functional and efficient than ever.See below for ways your laundry can be upgraded for good, clean modern living. The beauty of a modern laundry is that it can now feel like a well-considered space that matches its surrounds, reflecting seamless style. 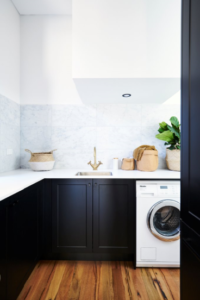 If you have the space and like the idea of your laundry being an extension of your kitchen, then consider designing it as part of a butler’s pantry. 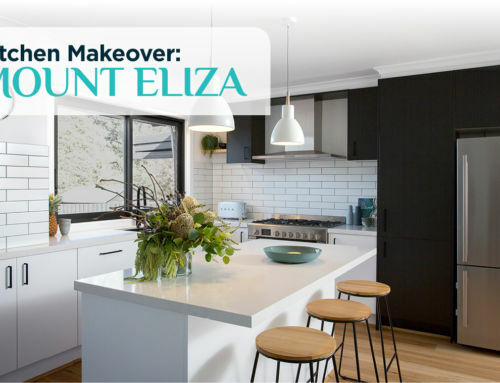 You can use the same materials to match your laundry cabinets, benchtops, splashback, sink and tap, shelves, and even smaller details like handles and décor, to create a truly seamless space. 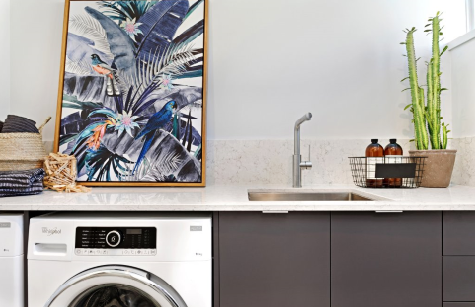 Even if your laundry is located away from the kitchen, creating the same look and feel will give the rooms in your house a sense of connection. 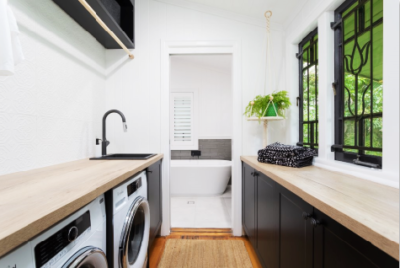 Another idea for creating seamless style it to draw upon the palette from whichever space your new laundry is located next to, such as a bathroom, or the backyard deck – this is often a stylish space in itself, as a reflection of the indoor/outdoor Aussie lifestyle. Beyond looking better than ever, the inside of your laundry cabinets can become blissful internals where ample storage and next-level organization reside. 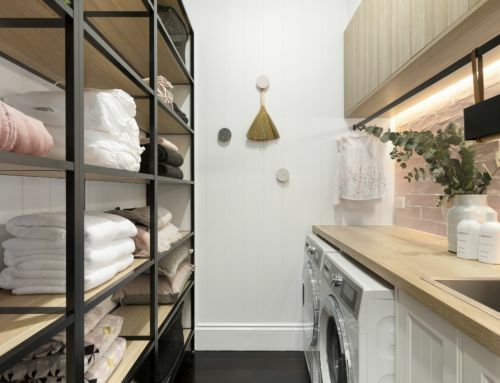 Modern laundries maximise the space available, whether large or small, by including overhead cabinets and open shelves, where everything is tucked away in easy to access baskets. In larger laundries, you can create storage not only for all things laundry related like your hampers, ironing board and washing detergent, but also for odds and ends that you don’t want cluttering up other rooms, like extra items from your bathroom. 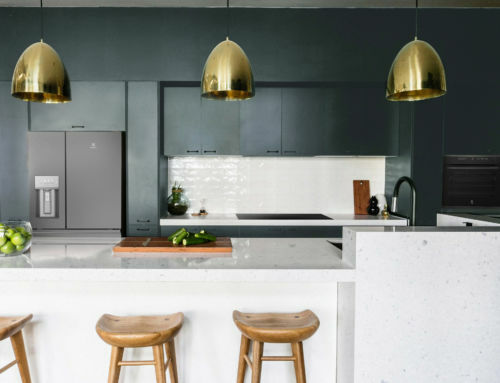 Modern laundries designed for the Aussie lifestyle will always include some benchtop space wherever possible – and the bigger the better. 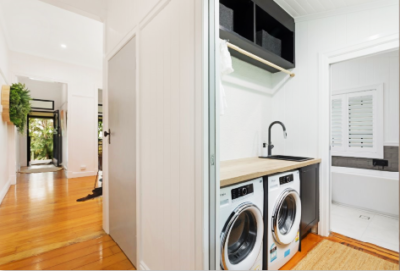 Where a run of cabinets are being placed against a wall, topping it with a beautiful big benchtop will create an ideal workplace for sorting and folding laundry. When there’s space available adjacent to the appliances, it’s worth putting in extra cabinets there also.  Keen to start planning your new laundry for good, clean modern living?